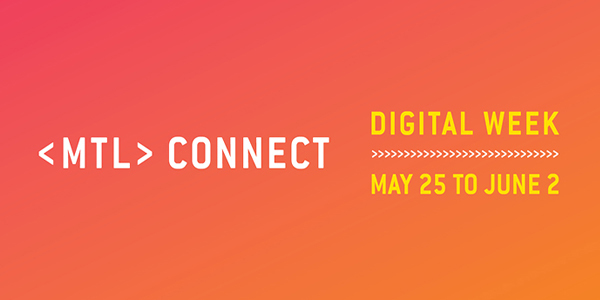 You wish to participate to <MTL> connect: Digital Week, taking place in Montreal from May 25 to June 2, 2019? This international event aims to look across the board at the main questions related to digital development, focusing on its economic, social, cultural and environmental impacts in various sectors of activity. The Montreal Digital Week will address 5 specific themes related to digital transformations: Health, Artificial intelligence, Architecture, Creativity and Mobility. To participate, several options are available: as a speaker, panelist, exhibitor at the ZoneTech, DemoTech technology demonstrator, recruitment pitch, volunteer or as a student ambassador. Whether you are an entrepreneur, a creative, a developer, a specialist in digital and technological tools, involved in digital research, currently redesigning your environment to adapt to the digital transformation, or even developing new ideas on the uses and impacts of the digital in your sector, we invite you to submit your application. You wish to participate to <MTL> connect: Digital Week as a panelist in one of the panels? Several topics will be proposed in connection with the 5 Pavilions. Consult them HERE. Are you looking to recruit within your organization? We offer you the opportunity to participate in recruitment sessions and meet your potential candidates. Note: Once your participation has been confirmed by the Programming Committee, we will ask you to become a Montreal Digital Spring Member to cover the costs of your participation. Participe to <MTL> connect: Digital Week and get the opportunity to exhibit your technology, or showcase your organization within the ZoneTech exhibition area. You want to invest yourself, gain experience, meet new people and discover digital transformations in Montreal in several sectors? This is the perfect opportunity to live the experience from the inside. Whether in logistics, technology, hospitality, ticketing, as a reporter, a host, or a photographer, we need you! You are active in the student life of your university, you have the proactive spirit and entrepreneur? Thus become an ambassador for <MTL> connect: Digital Week! Your role will be to represent your student projects as well as your community, but also to represent our vision and our values ​​within the 5 Pavilions. You will have access to the 5 thematic days in which you will be able to discover an innovative world, in the digital ecosystem, to have access to networking opportunities or even to future internship or job. Note: you must be at least 18 years old and be registered as a full-time or part-time student.